Violations listed on the sign included “engagement in socially and environmentally destructive practices,” predatory lending, and funding fossil fuels, gun manufacturers, and the construction of prisons. “Think of the world we could create with our own money. Let’s take control of our money! That is our money. This is the good fight!” said Sandra Lee Fewer, a member of the San Francisco Board of Supervisors. Other speakers at the rally stressed that the city’s money should be used for “the public good,” something that they saw as antithetical to traditional banking. 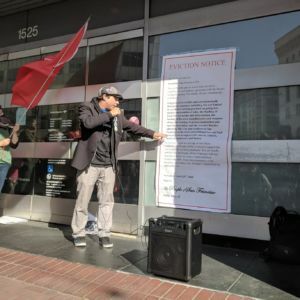 Members of the nurses union were also present, urging the city to divest from the “prison-industrial complex,” the “military-industrial complex,” and predatory mortgage loans, in addition to pipelines and energy infrastructure. Whereas protesters had previously stopped short of calls for a socialized bank, the groups sponsoring Wednesday’s rally openly support the creation of a public bank. The idea has been gaining support among activists over the course of the last two years, as divestment pressure on cities, states, and universities has increased. Most major banks in the U.S. are involved in the fossil fuel industry to some degree and other financial institutions, such as credit unions, are not big enough to offer the full range of financial services that the government of a major city would need. In 2016 and 2017, a number of cities voted to divest. So far, none of them have managed to fully do so. After voting for divestment in December, 2016, the Minneapolis City Council still has yet to propose a plan for how the city will replace Wells Fargo. In San Francisco, the Board of Supervisors has voted for six years to divest the city’s pension accounts from investments in fossil fuels, including coal and oil. Even after years of pressure, it was only in January that the Retirement Board approved a scaled-back plan, divesting the city from certain companies considered to be the “worst of the worst,” while leaving the rest of its $523 million in fossil fuel company stock intact. The protesters are unhappy with the slow pace of change. In a press release, the coalition of groups reiterated its goals and attempted to put political pressure on the city government. “Today, we are making it clear that we want city tax payer (sic) money and investments out of Wall Street’s greedy hands and any task force member that doesn’t fight for those of us most hurt by Wall Street, will be elected out of office or boycotted,” concludes the press release. The San Francisco rally shows that divestment continues to emotional resonate with many protesters. In spite of the crowds outside of banks, the movement has been unsuccessful in changing policies in most cities and most banks. Even very liberal cities, like San Francisco, seem to be finding the practical details of divestment more difficult to manage than the rhetoric.